For this prairie boy who grew up in the mixed poplar, spruce, birch forests of the Interlake of Manitoba, the trees of British Columbia will never lose their overwhelming majesty. There are, of course, the forests of the past, the old growth stumps, stumps so wide, that imagining the trees that grew from them seems impossible. There are still a couple of trees in Goldstream Park that existed around the time that Columbus came to America. There are the old photographs of loggers in front of and on top of tree trunks so large that they dwarf everything else. You seldom see trees that huge anymore but even in my yard, in my neighbours’ yards are massive trees, the kind of trees that tower over everything, great Douglas Firs in which Douglas Fir Squirrels gambol. They cast down vast numbers of pine cones onto my deck, both the trees and the squirrels, layers of pollen and needles. The trees are so large, so overwhelming, so majestic, that they dominate the neighbourhood. They seem indestructible. Therefore, it was a surprise when a neighbour came by and said that one of the firs on his property had rot in it that made it dangerous. It if toppled in a storm, it would take out my house. The tree was going to have to come down. 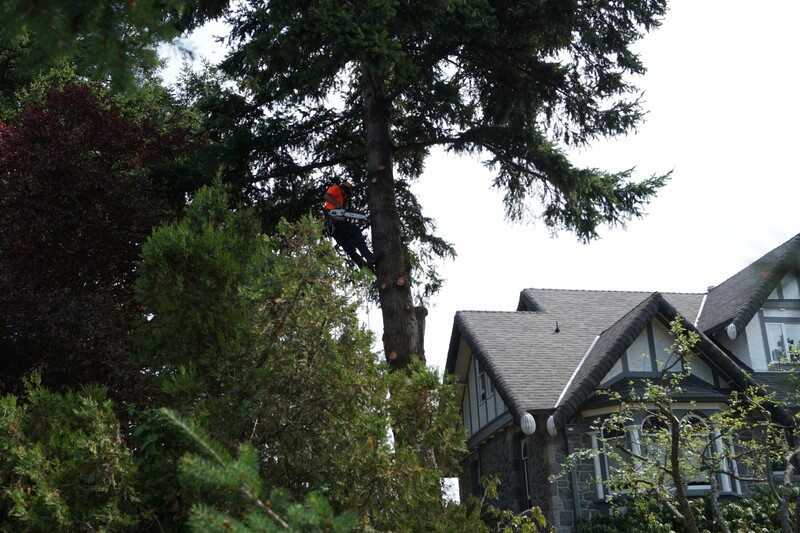 Getting permission to fell a tree in Victoria is not easy. You have to have it inspected and diagnosed. Someone has to pronounce it seriously ill, dangerous, and unsaveable. You need to get a permit. Only then do you contract an urban forester. With houses in every direction, you can’t cut down a tree like you would in the forest. No yelling timber and letting it fall. The urban foresters arrive, in this case, five of them. They bring a very large chipper to turn the branches into chips. They bring chain saws. They wear yellow helmets. One of them, the main man, as it were, puts a lot of gear onto a belt, a handsaw, a chainsaw, a bag with rope coiled inside. He wears spiked boots. He has ropes tied to him that he wraps around the tree. He leans back against his ropes, digs in his spiked boots and starts climbing the tree. He comes to the first branches, and these branches are not twigs, but thick, long, heavy and dangerous. He draws up his chain saw, pulls the start cord, cuts away the first branch, then the second, moves around the tree so he can cut branches that are out of reach. He works his way up, denuding the trunk. Below, his assistants drag away the branches, push them into the chipper. The chipper is noisy, scary, powerful and as I watch, I keep hoping no one puts his (or her, there is a woman on the crew), arm in too far. A human body would be reduced to a smear of blood in seconds. Brrrrrrrrrrrrrrrhhhhhh. It’s a harsh, threatening sound as the branches are reduced to small wooden bits. The climber keeps moving up, branches keep falling. He finds branches that are too dangerous to cut away directly so he leans out sawing them further out the branch, sometimes with his handsaw, sometimes with his chain saw. Having done that, he pulls back, digs in his spikes to get a good purchase, starts up his chain saw, cuts away the stub. He works his way up until there is just a crown of branches at the top. He cuts it off, shoves it to the side and it spirals down. The tree is not majestic anymore but a bent line against the sky. Years ago, at my previous house, I had to have two very large Lombardy Poplar trees cut down because they were interfering with the drainage tiles and starting to break up the paving in the lane. The logger I hired was Australian. He explained what he was going to do and he mentioned that topping the trees could be dangerous. Sometimes, he said, the tree whips back and forth and the logger can be thrown over the top. His rope and spiked boots do him no good then. They work to keep him from falling, not flying through the air. With the first poplar there was no problem but when he topped the second, the tree began to swing wildly and he had to hang with all his strength until it stopped moving. This fir tree remains stable after its crown is cut off and cast down. This logger, leaning back on his ropes at the top of the tree, is aware he has an audience. He ties a rope from his bag around the trunk, he knows his knots, he needs to know his knots for his life depends on them, and he pulls a trick I haven’t seen since I last attended All Sooke Day where local loggers competed with each other at logging skills. He kicks away from the tree trunk and rides the rope down to the ground. The first time I saw this, my heart stopped. This time, knowing what he was going to do, I just admired his skill and showmanship. The crew took a much needed break, then the logger went back up the tree trunk until he got close to the top where he started cutting the trunk off a section at a time. He worked smoothly, sawing the trunk in one direction, then the other, pushing the trunk over, away from himself so the sections of wood tumbled down to be dragged away by the crew and cut into stove wood lengths. He worked his way down until about twelve feet of trunk were left. This stub was cut down from the bottom. Chain saws were roaring, the chipper was roaring, the crew was raking and hauling and then it was done and where there had been a majestic tree, there was now a stump and a pile of wood. All done in a tight space among houses, in the urban forest. As I watched the loggers work, I wondered what the Icelanders who came to the West Coast in the 1880s thought. How different a world to which they had to adapt. Someone like Kristjan Benediktsson (Benson) from Hrafnabjorg. He first lived in Winnipeg, Selkirk and New Iceland. Then he went to Seattle for a winter. His family joined him in Bellingham. According to Icelanders of the Pacific Coast “in a few years he had cleared the land of trees”. I’d like to have a detailed diary describing how he did that. Helgi Thorsteinsson emigrated in 1887. He went to Victoria and then Point Roberts in 1894, according to Icelanders of the Pacific Coast. He first took 40 acres, then added 20 acres more. “All the land was covered in thick forest. Now most of the land is cleared and cultivated”. Coming from Iceland, a land with hardly any trees and those few that did exist were of no great size, there was much to learn. This is a double bitted axe. This is a cross cut saw. This is how you cut down a tree that may be a hundred feet tall and that will crush everything in its path when it does fall. In Iceland wood was so precious a commodity that there was elaborate rules over the ownership of driftwood. Here, in this West Coast world, there was wood everywhere. No houses of turf and rock. These massive trees could be turned into lumber and shingles. Time and again, descriptions of the West Coast Icelanders say the land was cleared of thick forest, that fine wooden homes were built. So much to learn in such a strange world. Yet, learn they did. Time and again, their short biographies say they built a fine house. What an accomplishment! As I watched the five people taking down the neighbour’s fir tree, cutting it up, I thought I could see the ghosts of our Icelandic countrymen working at what, in Iceland, must have seemed unimaginable. I remember reading a translated letter that was sent back to Iceland. The writer said, I can’t explain to you what things are like here. Beyond explaining, this forest world, filled with trees and wild beasts none of the Icelandic pioneers had ever known. Learning to cut down trees, mill them, build with their wood. Well done Páll from Mýrdalur, Eiríkur Anderson from Vesturhóp, Hinrik Eiríksson and all those others, and the wives and children who worked with them. Hard were the times and hard the work but triumph and success, like the triumph and success of the logger I watched the other day, can be counted in work well done, adaptions made, lessons learned. For an afternoon, you were with me, there on my deck as I watched a logger work his magic. This entry was posted in Uncategorized and tagged Bellingham, Iceland, Icelanders of the Pacific Coast, Icelandic settlers, immigration, logging, seattle, Urban forestry, West Coast by william. Bookmark the permalink.